There are about 600,000 francophone residents of Ontario, and many of them are not happy right now. On November 15, Premier Doug Ford’s government announced it was going to make several cuts to government services and programs. One plan was to eliminate the Office of the Commissioner of French-Language Services. It’s a non-partisan position that makes sure public services are adequately available in French in designated bilingual regions across the province. The other plan was to cancel a new French-language public university campus. Reaction and resistance to the announcement was swift. Activists mobilized, and protests started. Messages of support from French-speaking communities across Canada flooded in. Town councils in majority-French-speaking towns like Hawkesbury passed resolutions condemning the Ford government and pledging to protect access to public services in French. 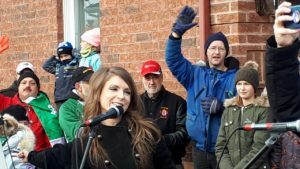 Political pressure mounted on people like Amanda Simard, the member of the legislature for Glengarry-Prescott-Russell, the most easterly district of the province where French is the majority language in most communities. Simard was elected in June 2018 as a Progressive Conservative (PC), the same party that Premier Doug Ford belongs to. She was appointed to be the assistant to the Minister Responsible for Francophone Affairs—a secondary role held by Attorney General Caroline Mulroney. (Yes, she’s the daughter of former Canadian Prime Minister Brian Mulroney). Simard, a Franco-Ontarian herself, apparently was unaware the cuts were being announced and was immediately under pressure to denounce them. And she did denounce them. First, in the legislature in Toronto, and then at a meeting attended by over 300 people on November 25 in the village of St-Isidore, in the heart of her district and Franco-Ontarian country. On November 29, Simard announced she was leaving the PC caucus and would sit as an independent. Francophone organizations had already planned a province-wide day of action and protest for December 1, and it went ahead. Rallies took place in communities large and small, from big cities to small northern towns. Hundreds of people gathered in mostly French-speaking Hawkesbury outside Simard’s local office. It was an unusual scene as people normally protest outside those offices because they are disappointed in the elected representative. In this case, the majority of them were supporting Simard and her decision to leave the PC caucus. It was a militant, but happy rally. There were strong shouts of “NOUS SOMMES! NOUS SERONS!” (We are! We will be! ), and “NOTRE SERVICES! NOTRE EDUCATION! NOTRE PLACE!” (Our services! Our education! Our place!). Green and white Franco-Ontarian flags and placards were everywhere. There were noisemakers, and the crowd was all ages. 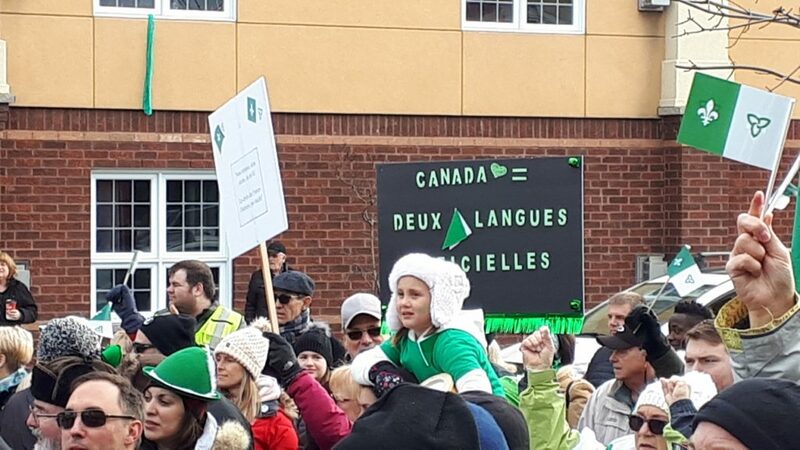 Former member of the legislature Jean-Poirier spoke, saying it was “incomprehensible,” that in 2018, Franco-Ontarians have to protest to maintain access to services in French. Federal Member of Parliament, Francis Drouin also briefly addressed the crowd. Drouin, a Liberal, has strongly opposed the measures being taken by the Ontario government. Amanda Simard stepped up to the microphone next. The welcome she got from the crowd was wild and not typical of when most local audiences welcome their member of the legislature. Simard had a difficult time quieting the crowd down so she could speak. “We’re stronger than ever,” Simard said. She also thanked every citizen and francophone organization across Canada for supporting her and the cause. Francophone rights in Ontario have had an occasionally troubled history. In 1912, the Ontario government introduced Regulation 17, which prohibited French from being taught in public schools past the second grade. That move was a blow to French-language education in the province. Regulation 17 was the result of lobbying by the anti-French, anti-Catholic Orange Lodge, which held a lot of influence over the governing Conservative Party. Regulation 12 was eventually repealed, but French schooling was only provided within existing English schools until 1968. From the 1950s to 1980s, the districts in the east and northeast with the strongest francophone populations began electing francophone members from all parties to the legislature. The Franco-Ontarian flag was created in 1977. During the 1970s and 1980s, there was a gradual introduction of French-language services from the Ontario government, and other agencies within specifically-designated bilingual areas of the province. In the 1990s, the provincial government reformed the public hospital system and tried to close the Montfort hospital in Ottawa, the only primarily French-language hospital in Ontario. Protests resulted and the hospital was saved due to a court challenge. There’s always been a perception that Ontario is an “English” province. Many of its people and communities are in fact not very English at all! I don’t live in Canada and have no intention of entering Canada ever again because I do not want to be bothered at the border. With that said, obviously I don’t care what is done in Canada. It’s up to a majority of Canadians to decide on such issues. But with regard to the issue as it would relate to the USA, I am 100 percent opposed to making any allowances for people who don’t speak English. If you want to live here, learn the damn language. It’s what my grandparents did and it is what all immigrants from Europe did.